ACLU of Utah Staff Attorney Leah Farrell. Litigated ad nauseam, the First Amendment is by now pretty cut and clear, right? Not exactly. And at a moment in history when protests and demonstrations have erupted around the country—including many in downtown Salt Lake City—following the election of President Donald Trump, it’s a good idea to know what you can legally say or do. On Wednesday, the ACLU of Utah hosted a public “Know Your Rights” training session at its headquarters that focused on speech, protest and police interaction. 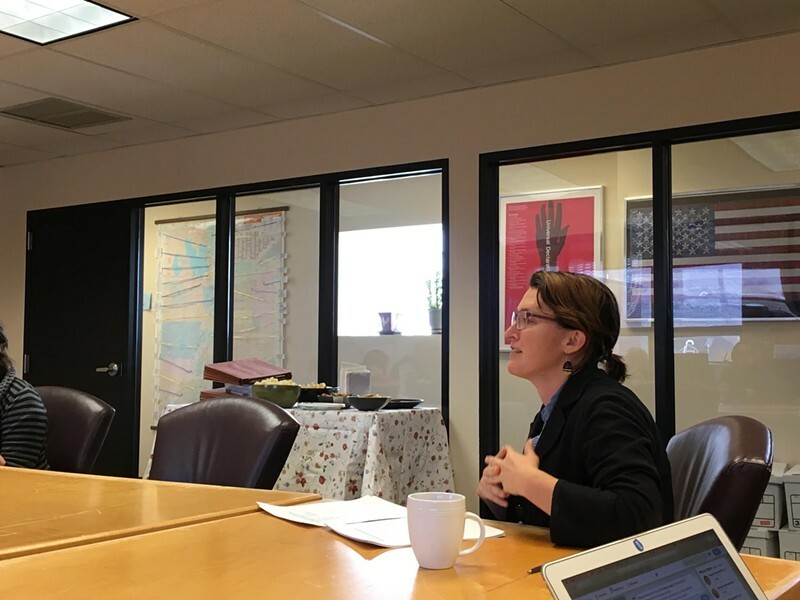 Clarifying that she wasn’t offering legal advice, Leah Farrell, a staff attorney with the ACLU of Utah, led the group through a broad view of the First Amendment while detailing some often overlooked nuances of the law and touching on a few obscure applications. Not all speech is protected, Farrell noted, to the dozen or so members of the advocacy community who gathered around a large table in an ACLU conference room. Case law has calcified citizens’ right to political expression, as well as religious and philosophical ideas. And there are numerous examples of forms of speech that are protected: peaceful protest, picketing, street theater, clothing and distribution of fliers. Other forms, however, fall into a gray area. “Some speech that’s not protected are defamation, causing panic, something called ‘fighting words’—basically inciting someone else to cause violence or any incitement to crime—and obscenity,” she said. The lines of protected speech are blurred further when a form seems to fit into two categories. Flipping off a police officer, she notes, could be considered an obscenity and therefore not protected, but that hand gesture could also be a form of political speech, depending on the context. The ACLU of Utah, which streamed and archived the entire seminar on its Facebook page, hosted the event days before a massive rally is expected 1 p.m. Saturday at the Utah State Capitol, organized by groups that hope to protect Bears Ears National Monument. Trump is expected to stop in Utah on Monday to announce that he is significantly shrinking the borders of Bears Ears and Grand Staircase-Escalante National Monuments. Assembling is constitutionally protected unless it involves trespassing or hinders others from getting where they need to go. Demonstrators can’t picket around residences—except the governor’s mansion. And if they’re intent on gathering outside a business, they need to be sure that the ground is public. Some forms of protest aren’t protected though they might be selectively enforced: chalked messages on the sidewalk, for example, could be considered vandalism. “Even though it’s not permanent it can result in an arrest or a charge for graffiti or interfering with property,” Farrell said. As for filming or recording police, Farrell says do it. “This is clearly established that you can film law enforcement or film people in public spaces,” she said. Utah doubled down on this right, passing its own ordinance permitting citizens to take footage of police. Even still, there are caveats.